Keywords: Coupling agent, injection moulding, mechanical properties, Pinus elliottii, polystyrene, wood plastic composites. In this work, the influence of three types of styrene maleic anhydride (SMA) oligomers on the adhesion of polystyrene wood plastic composites (WPC) was investigated. The composites were processed on a twin-screw co-rotating extruder below 200°C using 20 wt% of wood flour. The styrene maleic anhydride with different content of maleic anhydride groups, 30%, 25% and 20% (w/w) and levels of 1, 2 and 4% of coupling agents (styrene maleic anhydride 2000, styrene maleic anhydride 3000 and styrene maleic anhydride EF40) in the composite formulations were tested. Mechanical, physical and morphologic properties were evaluated. The styrene maleic anhydride improves the compatibility of hydrophilic wood flour with hydrophobic polystyrene matrix. It has been observed that the addition of styrene maleic anhydride increased the wood plastic composites mechanical properties with the incorporation of 2% wt of styrene maleic anhydride 2000. The mechanical properties showed to be dependent on content of maleic anhydride in the coupling agent. Treated and non-treated wood plastic composites showed similar density values, but the void content was reduced for treated composites. Scanning electron microscopy revel the better adhesion between polymer and matrix when coupling agent were used. Adhikary, K.B. ; Pang, S.; Staiger, M.P. 2008. Dimensional stability and mechanical behavior of wood-plastic composites based on recycled and virgin high-density polyethylene (HDPE). Composites Part B 39: 807-815. Bledzki, A.K. ; Letman, M., Viksne, A.; Rence, L. 2005. A comparison of compounding processes and wood type for wood fibre-PP composites. Composite Part A36: 789-797. Bledzki, A.K. ; Mamun, A.A.; Volk, J. 2010. Barley husk and coconut shell reinforced polypropylene composites: the effect of fibre physical, chemical and surface properties. Composite Science and Technology 70: 840-846. Borja, Y.; Rieb, G.; Lederer, K. 2006. Synthesis and characterization of polypropylene reinforced with cellulose I and II fibers. Journal of Applied Polymer Science 101: 364-369. Csikós, A.; Faludi, G.; Domján, A.; Renner, K.; Móczó, J.; Pukánszky, B. 2015. Modification of interfacial adhesion with a functionalized polymer in PLA/wood composites. European Polymer Journal 68: 592-600. Devaux, E.; Pak, S.H. ; Cazé, C. 2002. Effects of the structure os styrene-co-maleic anhydride oligomers on the interfacial properties in a glass fibre reinforced polystyrene composite material. Polymer Testing 21: 773-779. Gallagher, L.W. ; McDonald A.G. 2013. The effect of micron sized fibers in wood plastic composites. Maderas. Ciencia y tecnología 15: 357-374. George, G.; Joseph, K.; Nagarajan, E.R. ; Tomlal Jose, E.; Skrifvars, M. 2013. Thermal, calorimetric and crystallization behaviour of polypropylene/jute yarn bio-composites fabricated by commingling technique. Composites Part A 48: 110-120. Khonsari, A.; Taghiyari, H.R. ; Karimi, A.; Tajvidi, M. 2015. Study on the effect of wood flour geometry on physical and mechanical properties of wood-plastic composites. Maderas. Ciencia y tecnología 17: 545-558. Kim, H-S.; Lee, B-H.; Choi, S-W.; Kim, S.; Kim, H-J. 2007. The effect of types of maleic anhydride-grafted polypropylene (MAPP) on the interfacial adhesion properties of bio-flour-filled polypropylene composites. Composites Part A 38: 1473-1482. Nafchi, H.R. ; Abdouss, M.; Najaf, S.K. ; Gargari, R.M. ; Mazhar, M. 2015. Effects of nanoclay particles and oxidized polypropylene polymers on improvement of the termal properties of wood plastic composite. Maderas. Ciencia y tecnología 17: 45-54. Naghmouci, I.; Espinach, F.X. ; Mutjé, P.; Boufi, S. 2015. Polypropylene composites based on lignocellulosic fillers: how the filler morphology affects the composite properties. Materials and Design 65: 454-461. Nygård, P.; Tanem, B.S. ; Karlsen, T.; Brachet, P.; Leinsvang, B. 2008. Extrusion-based wood fibre-PP composites: wood powder and pelletized wood fibre - a comparative study. 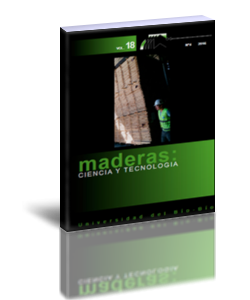 Composite Science and Technology 68: 3418-3424. Ornaghi Jr., H.L. ; Poletto, M.; Zattera, A.J. ; Amico, S.C. 2014. Correlation of the thermal stability and the decomposition kinetics of six different vegetal fibers. Cellulose 21: 177-188. Padma Priya S.; Ramakrishna, H.V. ; Rai, S.K. 2006. Density, void content, weight reduction and chemical resistance studies on waste silk fabric reinforced acrylonitrile-butadiene-styrene-toughened epoxy composites. Journal of Reinforced Plastics and Composites 25: 339-345. Poletto, M.; Dettenborn, J.; Zeni, M.; Zattera, A.J. 2011. Characterization of composites based on expanded polystyrene wastes and wood flour. Waste Management 31: 779-784. Poletto, M.; Zattera, A.J. ; Santana, R.M.C. 2014. Effect of natural oils on the stability and degradation kinetics of recycled polypropylene wood flour composites. Polymer Composites 10: 1935-1942. Poletto, M.; Zattera, A.J. 2015. Mechanical and dynamic mechanical properties of polystyrene composites reinforced with cellulose fibers: coupling agent effect. Journal of Thermoplastic Composite Materials DOI: 10.1177/0892705715619967. Sliwa, F.; El Bounia, N.; Charrier F.; Marin, G.; Malet, F. 2012. Mechanical and interfacial properties of wood and bio-based thermoplastic composites. Composite Science and Technology 72: 1733-1740. Sommerhuber, P.F. ; Wang, T.; Krause, A. 2016. Wood-plastic composites as potential applications of recycled plastics of electronic waste and recycled particleboard. Journal of Cleaner Production 121: 176-185. Takagi, H. Asano, A. 2008. Effects of processing conditions on flexural properties of cellulose nanofibers reinforced “green” composites. Composites Part A 39: 685-689.